FIBARO RGBW Controller is a universal, Z-Wave compatible RGB/RGBW controller. FIBARO RGBW Controller uses PWM output signal, which enables it to control LED, RGB, RGBW strips, halogen lights and fans. Controlled devices may be powered by 12 or 24 VDC. In addition the device supports up to four, 0V – 10V analog sensors, such as temperature sensors, humidity sensors, wind sensors, air quality sensors, light sensors etc. All IN and OUT terminals may be user configured for LED control or 0V-10V signal readouts. Before installation disconnect the voltage supply. 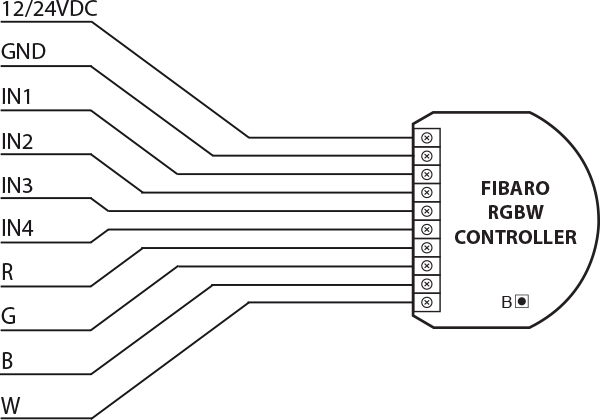 Connect FIBARO RGBW Controller according to one of the wiring diagrams (first, connect outputs and/or inputs, then connect voltage supply). FIBARO RGBW Controller is dedicated to operate in low voltage circuits of 12VDC or 24VDC. Connecting higher voltage load may result in FIBARO RGBW Controller damage. FIBARO RGBW Controller must be powered by the same voltage as the connected light source. I.e. if controlling 12V LED strip, the module must be connected to 12V power supply. Similarly, if controlling 24V RGBW strip, FIBARO RGBW Controller must be powered by 24V voltage supply. FIBARO RGBW Controller has 0-10V input. There is no 0-10V output. Output is controlled by PWM at 244Hz. FIBARO RGBW Controller must be powered by 12VDC or 24 VDC stabilized power supply with outputs load capacity matched to loads voltage. Sensors using 0-10V interface use wire connection to inputs I1 - I4. Maximum length of 0-10V connection line is 10 m. Observe sensor's manufacturer recommendations towards 0-10V line diameter. In case of connecting long RGBW/RGB/LED strips voltage drops may occur, resulting in lower light brightness further from R/G/B/W outputs. To eliminate this effect it's recommended to connect few shorter strips in parallel connection instead of one long strip connected serially. Maximum recommended wire length, used to connect R/G/B/W outputs with a RGBW/RGB/LED strip is 10 m. Observe connected loads manufacturer recommendations towards connection wire diameter. Note the device must be powered by a dedicated stabilized power adapter. The device can be added to the network manually or using auto-inclusion function. To disable auto-inclusion mode press the B-button briefly, after connecting the power supply. Removing (Exclusion) – Z-Wave device learning mode, allowing to remove the device from the existing Z-Wave network. FIBARO RGBW Controller allows for the active power and energy consumption monitoring. Data is sent to the main Z-Wave controller, e.g. Home Center. Measuring is carried out by the most advanced micro-controller technology, assuring maximum accuracy and precision. Reset procedure erases memory of the device, including all information on energy consumption, user-defined colour presets, the Z-Wave network and the main controller. FIBARO RGBW Controller offers fully configurable operating modes. Operating mode is set during first configuration in Home Center 2 interface. Other main controllers require dedicated setting of parameter 14. RGB/RGBW – controlling RGBW/RGB/LED strips or Halogen lights based on signals from switches connected to I1-I4 inputs. User may precisely set illumination colour. IN/OUT – All inputs I1 – I4 and outputs R, G, B, W may be independently configured by the user. Depending on configuration the device will be presented in Home Center 2 interface as sensors or dimmers. User defines sensor type and its operating range. If a given channel operates in OUT mode, user may control e.g. LED or Halogen lamp brightness. The device may be controlled by momentary or toggle switches. FIBARO RGBW Controller may serve as 0-10V input module and operate with any 0-10V sensor, e.g. temperature sensors, wind speed/direction sensors, air quality sensors, light sensors, etc. – I1 controls R channel. – I2 controls G channel. – I3 controls B channel. – I4 controls W channel. Controlling I1-I4 inputs is achieved by connecting ground wire (GND) to specified channel. NORMAL mode – controlling output assigned to given input terminal. In this setting outputs will be controlled independently from one another, e.g. allowing for free adjusting each colours saturation. Double click will set a given channel’s saturation to 100%. This operating mode works with momentary and toggle switches. BRIGHTNESS mode – all outputs are controlled together, i.e. one switch controls brightness of all channels at the same time. This operating mode works with momentary and toggle switches. RAINBOW mode – all outputs are controlled together giving a transition of full colours spectrum. RAINBOW mode works with momentary switches only. FIBARO RGBW Controller has 4 controllable, analog inputs I1 – I4, allowing for 0-10V analog signal interpretation. 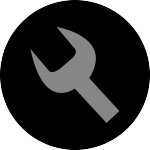 This functionality may be used in operation with analog sensors and potentiometers. What’s more, in IN/OUT mode all inputs and outputs may be configured independently, e.g. I1 may be configured as 0-10V sensor input and I2-I4 may control LED strip or Halogen lamps. Another option is to configure I1 as 0-10V input and connect 0-10V potentiometer to it, and connecting Halogen lamps to R output. At the same time, other inputs may work with 0-10V sensors. 1st Association Group assigned to I1 input – sends control frame to associated devices each time the device state changes (ON / OFF). 2nd Association Group assigned to I2 input – sends control frame to associated devices each time the device state changes (ON / OFF). 3rd Association Group assigned to I3 input – sends control frame to associated devices each time the device state changes (ON / OFF). 4th Association Group assigned to I4 input – sends control frame to associated devices each time the device state changes (ON / OFF). 5th Association Group reports device status. Only one device may be assigned to this group, main controller by default. It is not recommended to modify this group’s settings. FIBARO RGBW Controller allows for controlling 5 regular and 5 multichannel devices per an association group, out of which 1 field is reserved for the Z-Wave network main controller. FIBARO RGBW Controller allows to customize its operation to user’s needs. The settings are available in the FIBARO interface as simple options that may be chosen by selecting the appropriate box. Maximum brightening level cannot be lower than Minimum dimmming level. Minimum dimmming level cannot be higher than Maximum brightening level. Parameter defines a value by which input voltage must change in order to be reported to the main controller. New value is calculated based on last reported value. Reports will be sent if last reported value differs from the current value or in case of polling. 1. What is a RGBW Controller? 2. The device supports up to four, 0V – 10V analog sensors. Can you give a few examples? 3. What is the rated output power? 4. What is the maximum length of LED strip I can have? 5. Does RGBW Controller can be powered by 230V AC? 6. Can I connect a light switch/button to RGBW Controller? 7. Is it fitted with a DC power supply? 8. Can I control the four RGBW channels, at the same time use the inputs to monitor sensors and without input readings have direct effect on the RGBW output channels? 9. Can I activate scenes with RGBW dimmer – 4 switches? 10. Can I connect the Dallas DS18B20 Temperature Sensor additionally if I use RGB LED strip connected to my RGBW? 11. What is the resolution of 0-10V analog inputs? Our module has a resolution up to 0,01V, but due to constrains of the of the Z-Wave communication protocol the resolution is limited to 0.1V. 12. Is it possible to use a RGBW switch in the Sprinkler Panel in order to switch 4 valves? It is possible, but you can’t use RGBW devices in the sprinklers panel so you’d have to write some custom scenes to make this work. You must input 24V and change “Controlled device” for “Output / Input”. After this you can control 4 devices (sprinklers). 13. I would like to link the two controllers so they synchronize colours. How can this be done? I’ve associated them in Group 1, but this seems to have no effect. 14. I want to use “Programs of RGBW” in the scene. What should I do? 15. Do I have to buy RGBW LED stripe to achieve white illumination? 16. May the RGBW Controller be used to control 0-10V devices? 17. Can I connect different light sources to each of channels? 18. How to turn on alarm function?